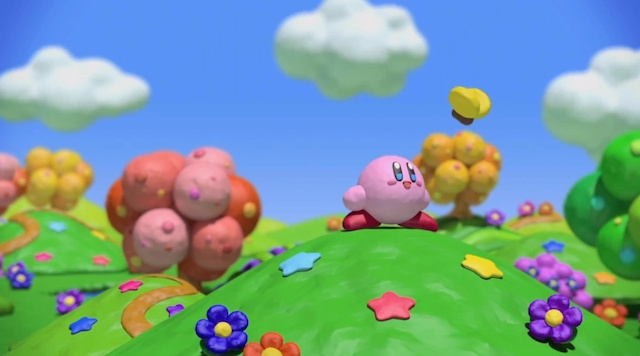 Despite having gorgeous claymation-inspired visuals and lashings of colour, Kirby and the Rainbow Curse only managed to reach the third spot in the Japanese charts, being beaten by Tales of Zestiria on PS3 and The Legend of Legacy on the 3DS. It's a shame given just how charming the game looks, but considering the heavier focus on handheld systems in Japan, we're not completely surprised, but we are disappointed. Elsewhere in the charts Mario Kart 8 and Super Smash Bros. for Wii U continue to perform admirably given their age, but no more so than the triplet of games that fall under Yokai Watch 2, the latest of which is currently rocketing towards 2,500,000 copies alongside Pokémon Omega Ruby and Alpha Sapphire. The New Nintendo 3DS LL remains in a comfortable lead against its contenders despite dropping 5,000 units compared to last week. The Wii U continues to fall at a gradual rate as the post-holiday lull sets in. Do you think Kirby's latest adventure will be more successful in its eventual release in the West? Lets us know by leaving a comment! Just put Yokai in the title of Kirby's then you have gold! I'll be waiting on picking up this game. There's too many games (and amiibo) coming out soon for me to get this. I'm saving up for Splatoon, Mario Party 10, and Borderlands the Handsome Collection. Also maybe Final Fantasy Type 0 HD... maybe. TBH i wasnt excited at all for kirby and the rainbow curse, well a little bit, but i wasnt gonna buy it, ohh how that has changed now, i looked gameplays and the soundtrack o omg its so amazing, im actually gonna buy this game now, and the movement mechanic is preatty neat aswell! God whats wrong with Japan?Who doesn't want a Kirby game,especially a cute one like this! Aw. I know I'm getting the game, though! 3rd is not that bad. Let's see how he does the next few weeks. Now for something completely different: I really hope Legend of Legacy gets localised one day, seems like an interesting game from what I've seen and read so far! The placing is sort of insignificant. Some weeks 50k will get you 1st, some weeks 50k will be outside the top 5. The actual figures of 30k are a bit disappointing but not a big surprise. I'm not really surprised about Kirby,pretty sure the touchscreen controls will have put many off of it.I didn't enjoy Canvas Curse on the DS and don't particularly like having to look at the Gamepad on the Murfy levels in Rayman so that's put me off.I'm sure it will review well but unless it goes on sale on the Eshop I can't see myself getting this.If only it was a traditional Kirby platformer with these graphics,it would have been a day one buy for me. Eh I think we could all figure that this game probably wasn't going to sell super well. Well a new Tales game came out so of course Kirby didn't make it to the top. Especially since there's 8 million more PS3 owners than Wii U owners. The Legend of Legacy has to be the most generic title ever. Donkey Kong Country: Tropical Freeze and Captain Toad: Treasure Tracker sold 38,265 and 27,949 copies respectively during their first week in Japan. So these Kirby sales aren't half as bad as you might think. Kirby even outsold Wind Waker HD with about 2000 copies. I thought Legend of Legacy would do better, around 100.000. Probably SE thought the same way. Well, launching the same week as a Tales game is something most would want to avoid. "but considering the heavier focus on handled systems in Japan, we're not completely surprised"
Yet nr. 1 is a new PS3 title selling 10 times more than the Wii U game. I don't expect Kirby to do much better in the west. It's too much of niche title and I'm personally not interested either. It got third. Not too shabby if you ask me. Anyways, I'm definitely getting it! I adore the way Rainbow Curse looks, but I'm not feeling the gameplay. I don't think I'll be getting it in the near future, as much as I'm a Kirby fanboy. GTA back on the list. Kirby had no chance against a Tales game. Should have released Kirby on the 3DS and not Wii U.
Oof. The U fell behind the PS3. That has to hurt. Animal Crossing is going to get to 4,000,000 in Japan yet. Unreal. Love that game. They haven't said when Kirby is coming to the UK we have to wait till july or sometime . Could you imagine what would happen if they made a Yokai Watch x Pokemon game? For a Wii U game in that market, it did pretty good. Especially since it's not a Kirby "proper" game. It's basically a spin-off with an unusual control method to be skeptical of. Always sad to see Wii U sales for me. Love it so much. Not bad considering the competition actually. Glad to see Tales of Zestiria and Legend of Legacy performing so well on their first weeks. I love the graphics for Rainbow Curse, but I never felt the stylus controlled 'Canvas curse' was very enthralling. In fact in my experience it was rather dull and boring, and gameplay footage of Rainbow Curse does not instill curiosity for me. I'd rather see a successor to Mass Attack, which is still my favorite Kirby game outside of the platforming series. Some of these numbers just don't make any sense to me. Like the PS4 sold almost 15,000 units but the biggest selling game for the thing only shifted 4,000... Are people in Japan just buying the console to sit in their living rooms and look pretty? @OorWullie I agree with you. I like the Kirby Platformer games, and hated Canvas Curse on the DS. One thing that was disappointing was the fact that the only Kirby title released on the Gamecube was that Kirby's Air Ride, which was horrible. Kirby seems to have his ups and downs. Kirby's Adventure on the NES released right before the Super came out, which didn't help it become a big huge hit. Kirby 64 came out late on the N64, and Kirby's Return To Dream Land released pretty late in the Wii and with big hits coming out around the same time. It's almost like nintendo doesn't really care about Kirby too much to think that he'd be a huge seller. They may be very easy to beat, but these games have something that keeps even older people to play...and it is weird to play a pink ball of puff with very cutesy level designs and music...hey, it's fun!!!! @kobashi100 Not if you consider the install base of each system. I have not played Rainbow Curse, but I have played Canvas Curse, and I have to ask, why is this game on the Wii U instead of the 3DS. At least for Canvas Curse, you had to keep your eyes on the screen to play properly, so if you're going to keep your eyes on the Wii U Gamepad the entire time, what's the point of the game being on the Wii U at all. @DarkKirby You don't have to keep your eyes on the gamepad the whole time. Once your brain recognizes the dimensions of the gamepad you are able to use it without looking down. It gives the visual queues on the tv. I do this with pikmin, w101 and the smash bros level creator all the time. ~35k combined 3DS sales vs. ~15k Vita sales is rather good. Wii U being outsold close to 2:1 by PS4 is rather bad.